​My portfolio featuring mods for Automobilista by Reiza Studios. Welcome to my portfolio of Automobilista from Reiza Studios! Here is where you can see some of the material I have created as mods for this game. Automobilista is a simulation racing game developed by Brazil's Reiza Studios. This game is almost essentially an upgraded rFactor. AMS is a great game but has a very limited mod community. So you can only do so much or only see so much in the way of new tracks and new cars. With that said, I still wanted to develop material for AMS. Unlike GTR2 or rFactor, there is no real way to preview skins in Automobilista without having to load the game beforehand. That is, unless you downloaded a viewer to see skins as you edit them. Reiza Studios and RaceDevelopment both have viewer files available if you have 3D Studio Max to view the 3D meshes. Since it costs an arm and a leg to get 3D Studio Max, you have to find some other method to view those files. While you can view VEH files in 3DSimEd, I have had no luck loading models into 3DSimEd for Automobilista models. I basically have to study similar skins to determine what element of a vehicle mesh goes where. You also have to tone down the opacity so the vehicles do not appear overly glossy and shiny. You can, of course, play around with certain parts of skins to affect the glossy appeal. Your painting skills with rFactor also play well in making skins for Automobilista. If you happen to put the skin into a game, you can update the skin in real time by refreshing the game as you select different skins. The importance of previewing skins can be costly. For example, you may place a logo on some part of the car, but it may not come out right because the logo is not aligned correctly. The model may require you to rotate or mirror (or both) certain logos so that they appear correctly on the car. You may also edit a part of the car that isn't supposed to be edited or may appear strange. So it is very important to have some kind of tool or method to make car skins that you can properly have control of. If you are using GIMP like I am, there is a way to ensure your car isn't overly shiny. Flatten the image of your skin (make sure to have the wireframe (if available) turned off if you don't want your vehicle to look funky!) and add a Layer Mask. You can add a Layer Mask by clicking on the "Layer" menu followed by going to "Mask" and selecting "Add Layer Mask." Or, you can right click on the layer tab and choose "Add Layer Mask." In the Add Layer Mask, set the option to its Alpha Channel. You can either save the resulting image as a DDS, or you may Apply the Layer Mask followed by saving to DDS. The DDS format you want to save it as is BC3/DXT5 and with mipmaps generated. This will ensure the car will not appear overly glossy, as the DXT5 format allows for transparencies and alpha channel information. Before I show you my Automobilista skinning work, let me share with you something I got into recently. This close image shows the textures I applied to the driver for his/her suit, gloves, and helmet. This is a Design Study where I attempted to skin the driver in addition to the driver's vehicle. As you can see, the driver is visible with his/her racing gear on. The driver normally isn't visible for the most part, but for some vehicles (such as open-body go-karts or especially motorcycles), you get a full-on view of the driver. Simply designing a skin for a car is one thing. What adds some more personality is if you can come together with some fine driver textures for the racing suit, the racing gloves, and the racing helmet. I am basically in the process of re-working some of my Automobilista material to take advantage of these individual features. • Save the driver suit as a BC1/DXT1 DDS file and generate mipmaps. • Save the driver gloves as a BC1/DXT1 DDS file and generate mipmaps. • Save the driver helmet as a BC3/DXT5 DDS file and generate mipmaps. PLEASE be sure to flatten the image before exporting to DDS. For now, though, I invite you to stay on this page and take a look at my skins for AMS machines. From here, this is my portfolio of designs for Automobilista vehicles. Like what you see? I am considering offering my designs for download on various popular sim racing game resource outlets (like RaceDepartment and NoGripRacing). So you may see my work here offered in the future! NOTE: All vehicles appear in the order of whichever different vehicle I skinned first. Each vehicle skinned features my oldest works first. So the least recent vehicles I skinned will be featured first. If I created multiple liveries for a vehicle, the most recent work for that vehicle will appear later for that featured vehicle. Despite the various barriers in trying to design a skin for Automobilista, I tried making this livery for the Chevrolet Camaro SS in AMS. 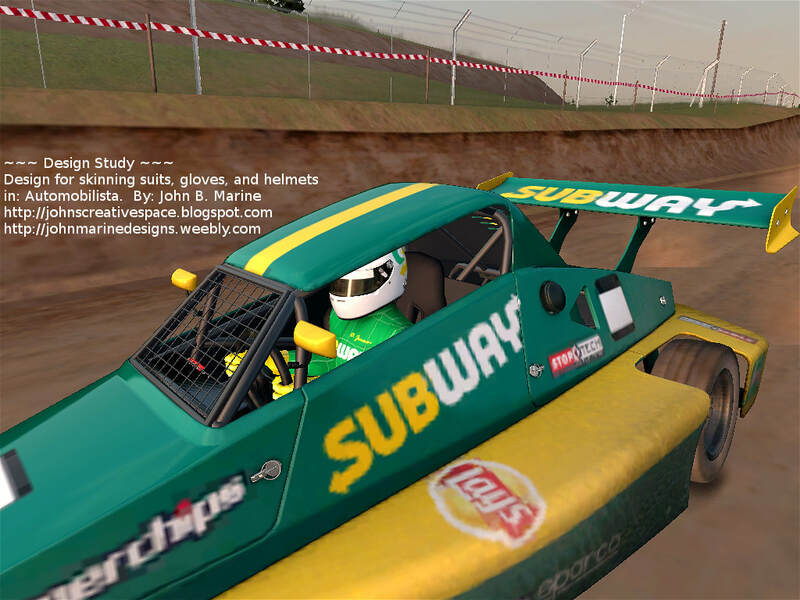 The Formula Dirt (or F-Dirt) cars in Automobilista are meant to be beginner cars for those looking to do off-road racing. 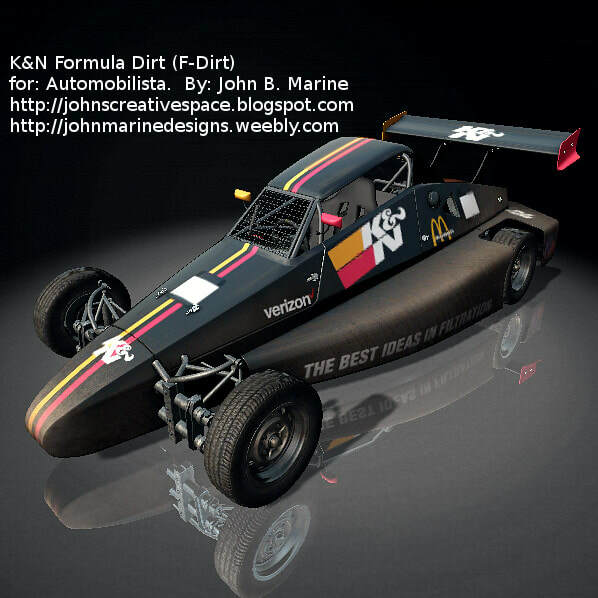 It is essentially a Formula Vee car meant to race off-road and with an open differential. It is powered by a 1.6-liter Volkswagen engine making about 120hp and runs on road tires. With the challenges of not having something as helpful in skin making for Automobilista like using Content Manager for Assetto Corsa, and since I had no luck uploading AMS models to 3DSimEd, I basically had to open the Automobilista game (which involves opening Steam as well) to keep previewing my car's livery before really being done with it. 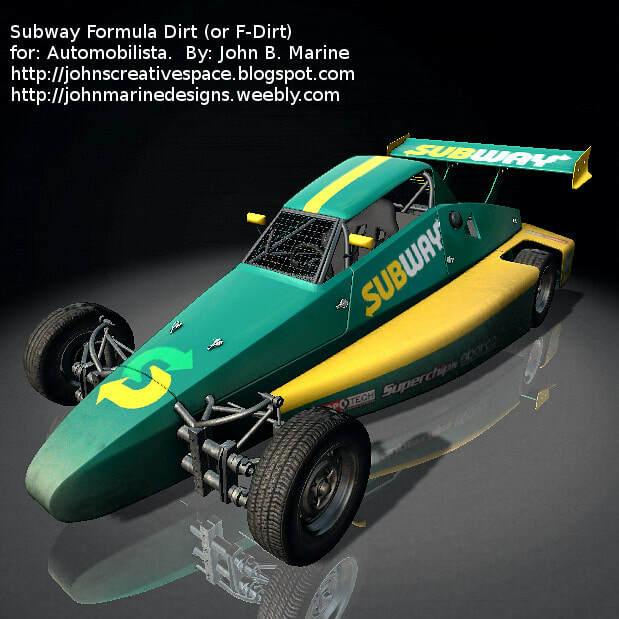 This Formula Dirt (F-Dirt) car is adorned in Subway livery. A Formula Dirt (F-Dirt) car adorned in the livery of K&N Air Filters. 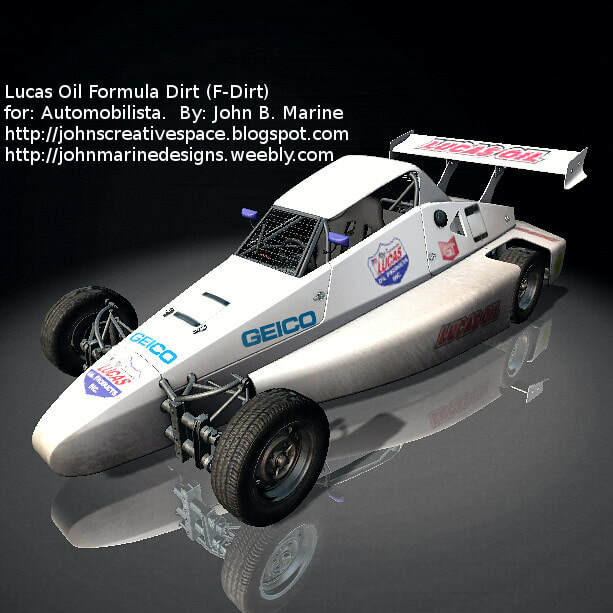 This Formula Dirt (F-Dirt) car is adorned in Lucas Oil livery. 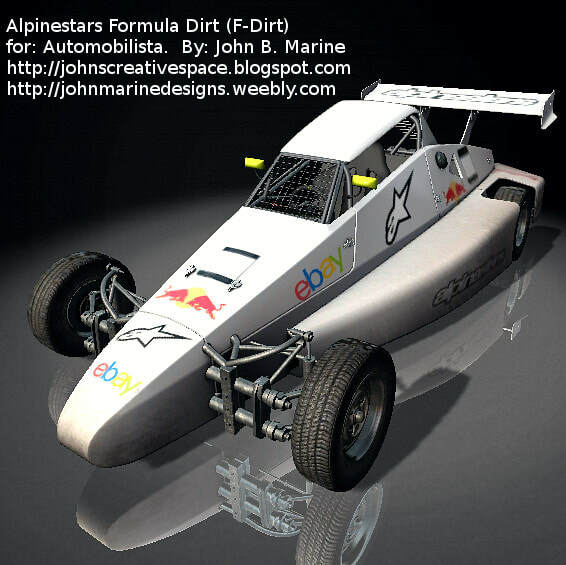 Alpinestars livery adorns this Formula Dirt (F-Dirt) car. 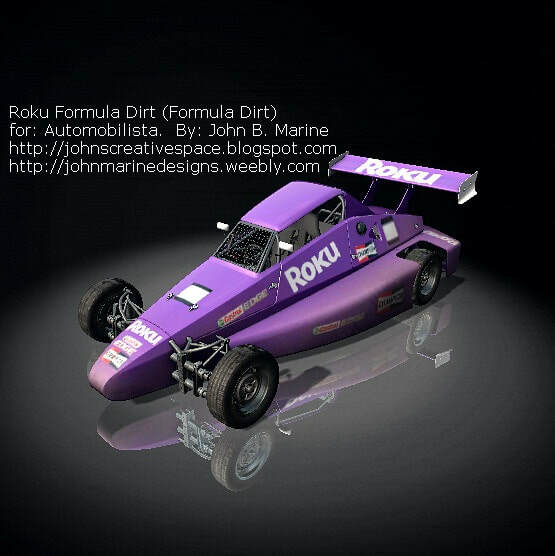 This is the Formula Dirt (F-Dirt) car in Roku livery. 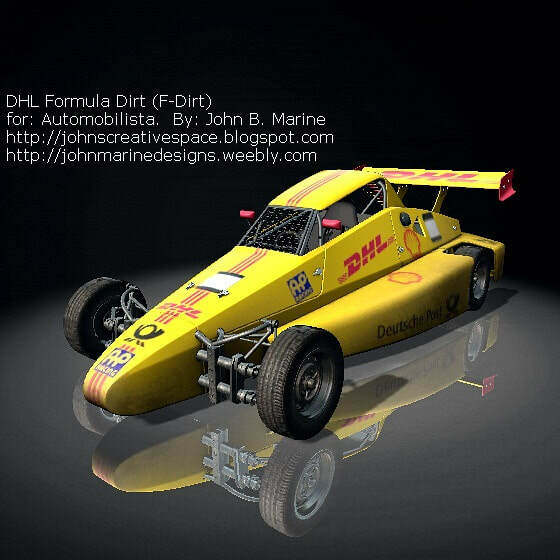 DHL, and its yellow with red accents livery, adorns this Formula Dirt (F-Dirt) car for Automobilista. 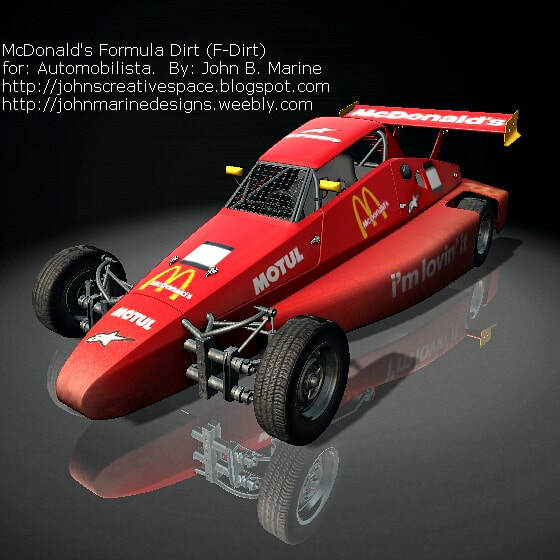 I created this McDonald's skin for this Formula Dirt (F-Dirt) car. RTIC Coolers (a Houston company!) 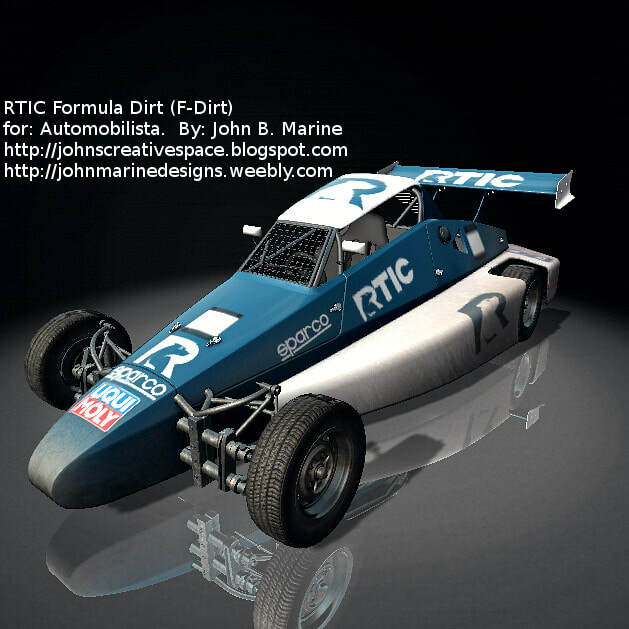 is the livery applied to this Formula Dirt (F-Dirt) car. 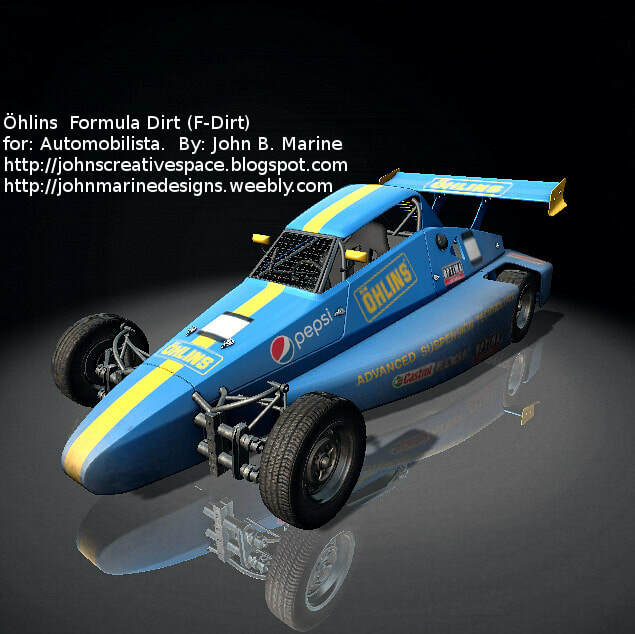 The Swedish performance suspension company, Öhlins, is the livery on this Formula Dirt (F-Dirt) car. 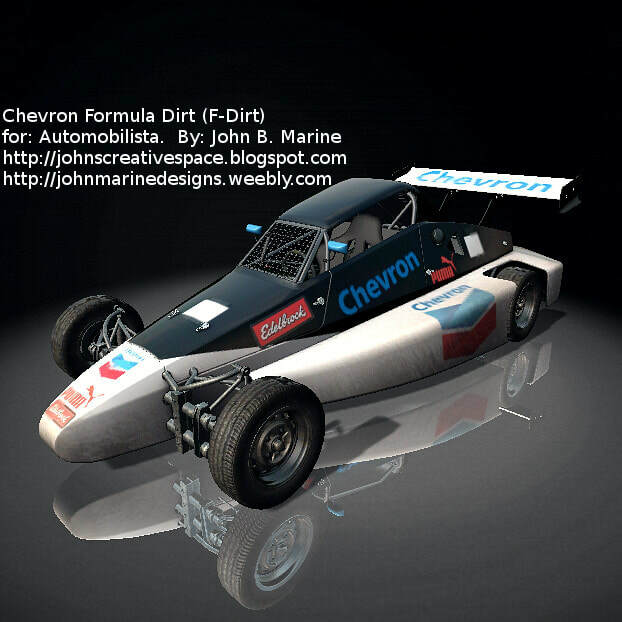 Chevron Gasoline is the primary sponsor of this Formula Dirt (F-Dirt) car. A concept shared by off-road racing veteran and NASCAR veteran Robby Gordon, Stadium Super Trucks are essentially trophy trucks designed to run mostly on tarmac courses. Almost as if to say these trucks are too good for yet another proper off-road series featuring trophy trucks. They may appear like real-life and full size remote control trucks, but these trucks are 100% real. They are also incredibly difficult to control. If anything, Stadium Super Trucks teach you about weight shifting and proper control accelerating and braking. The races are even more nuts than trying to pilot one of these trucks. 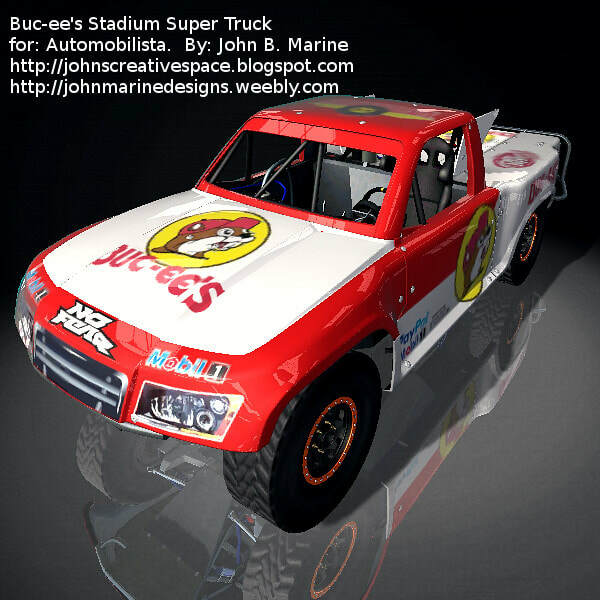 This is a Stadium Super Truck with livery of Buc-ee's. Buc-ee's is a popular gas station chain here in Texas with many of its stores being excellent tourist traps. 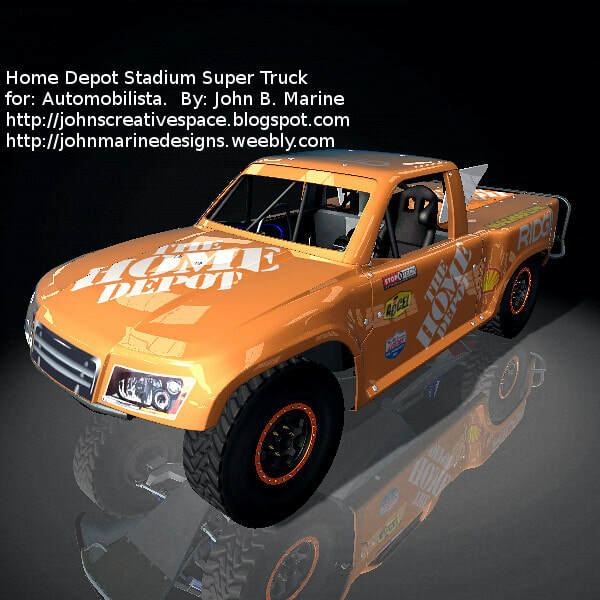 The Stadium Super Truck you see here was designed with Home Depot livery. This actually was the first Stadium Super Truck I was developing before you saw the Buc-ee's truck. Before Automobilista, there were "Stock Car Extreme" and "Formula Truck 2013" from Reiza Studios. The latter is the origin of the next vehicle I am about to share in my AMS portfolio. I had a lot of trouble trying to make the windshield transparent. I had to basically learn to make a certain alpha mask to try to get things to look right. Even still, I mostly focused on the exterior of this truck. By the way, this is the IVECO Stralis Hi-Way. This vehicle I skinned is one of many different manufacturers that race in this popular Brazilian racing series. I learned IVECO is an Italian commercial vehicles manufacturer whose name means "Industrial Vehicles Corporation. 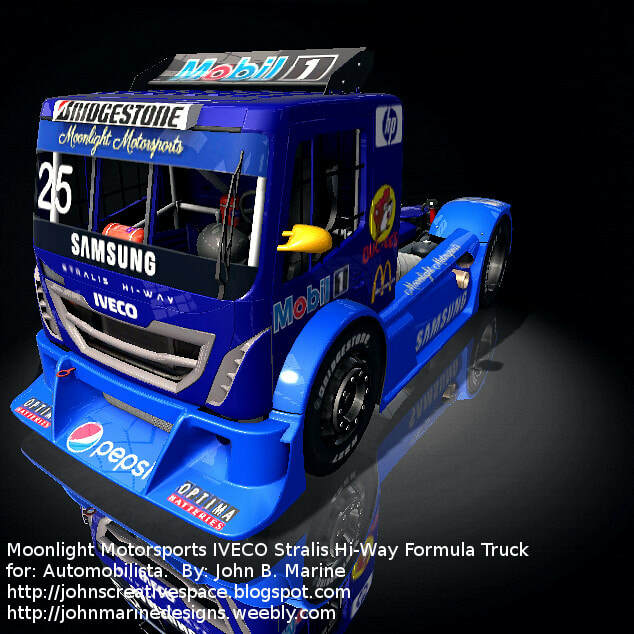 This is an IVECO Stralis Hi-Way that races in Brazil's Formula Truck series. 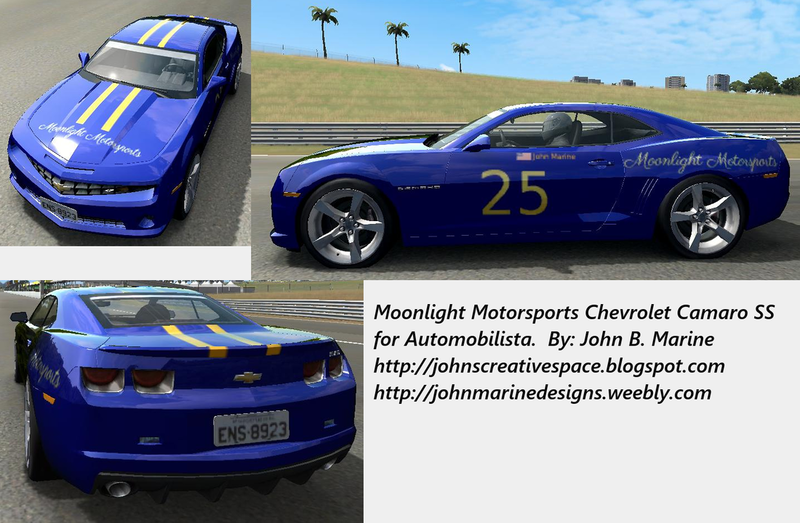 It is painted in the livery of Moonlight Motorsports, my fictional racing team. I saw the windshield was completely transparent, and it is not supposed to be. So somewhat look at this image as a work-in-progress. The Formula Trainer cars are low-level pure racing machines. If its body style seems similar to you, that is because Formula Traineris basically Formula Ford. The cars are offered in two trims- Novice (104hp with grooved road tires) and Advanced (141hp with racing slick tires). I have two different projects lined up for both trims of Formula Trainer. When you look at the caption for each picture, you will see whether the car is a Novice Formula Trainer or an Advanced Formula Trainer. 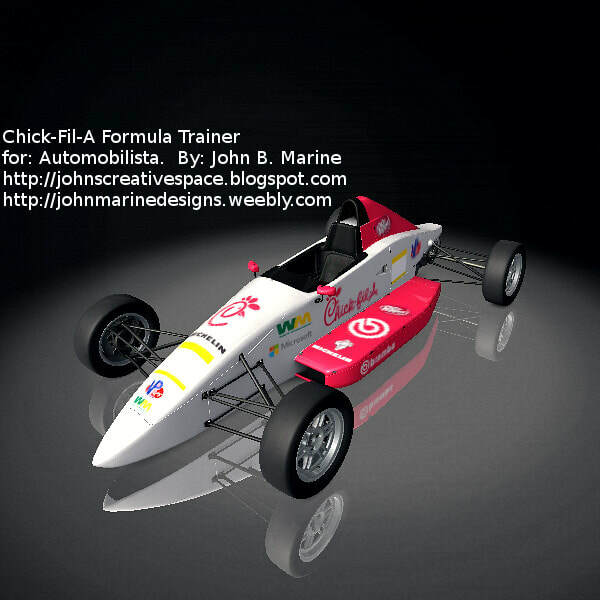 The Formula Trainer here is outfitted in Chick-Fil-A livery. ADVANCED Formula Trainer. 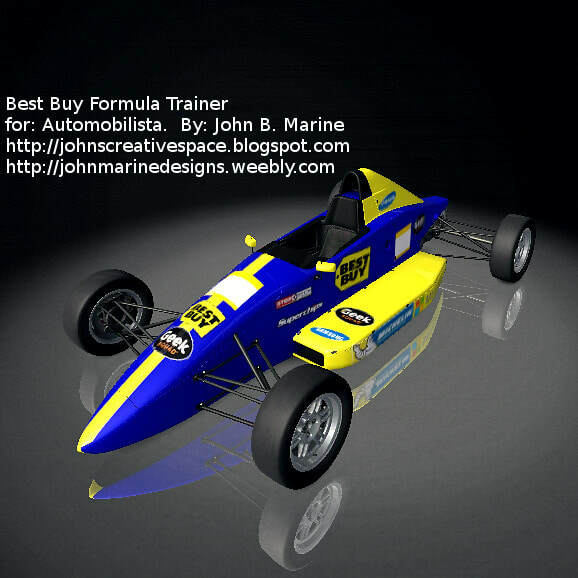 This is a Best Buy-liveried Formula Trainer for Automobilista. ADVANCED Formula Trainer. 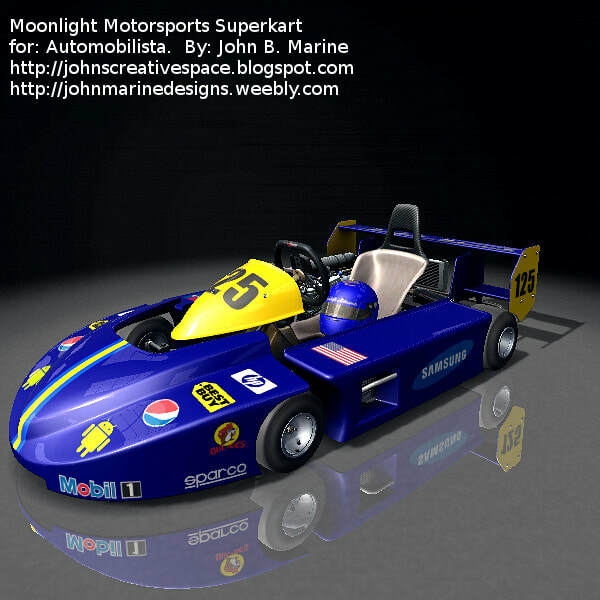 There are three types of kart chassis in Automobilista- open, closed, and superkart. This section pertains to the open karts. For many people, grooming racing talent often starts with go-karts. Many do go-kart racing for fun. Many others try to enhance their racing skill. Because of the popularity of kart racing games, many people often think of racing with weapons and items. This, however, is REAL kart racing. Automobilista has offered a variety of kart styles along with many different kart racing tracks. 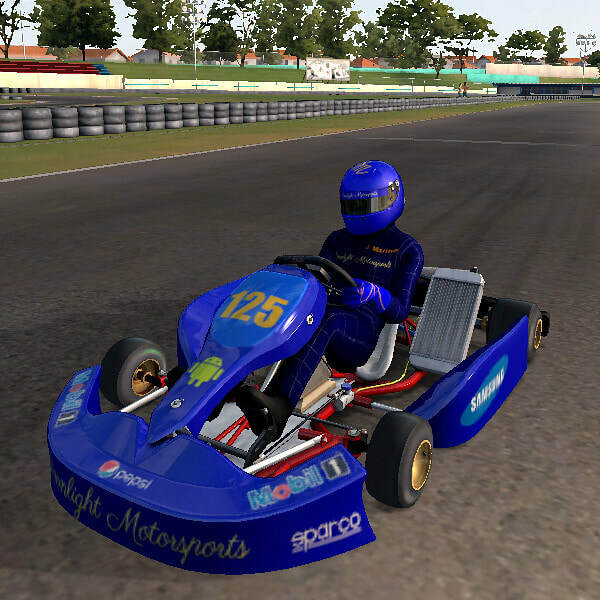 AMS offers two classes of kart- regular karts and superkarts. The former will be expressed in this section. 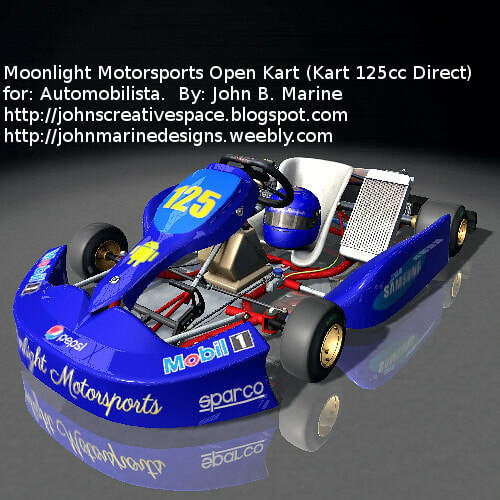 Here is an open kart in Automobilista in the colors of my fictional race team, Moonlight Motorsports. This kart is in the class of direct 125cc karts. 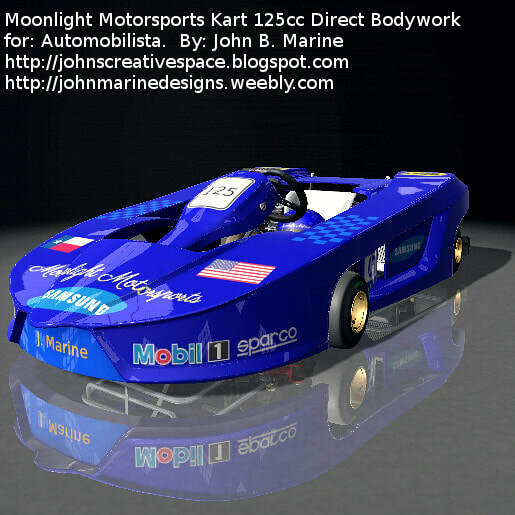 This is my Moonlight Motorsports closed body kart for Automobilista. Superkarts are the most insane karts you will ever see being raced. Unlike the previous two karts I have featured, superkarts are powered by 250cc engines. These machines could reach top speeds in excess of 160 mph. Imagine 160 mph in racing machines with no suspensions and some serious downforce. You will be gripping corners like a boss in these things! Moonlight Motorsports appears once again as the supplied livery for a machine. This time, it's the Superkart in Automobilista. Automobilista features four varieties of Mitsubishi Lancer. This one pertains to one of the Lancer Cup machines raced primarily in Brazil. The car featured in this section is the Mitsubishi Lancer R. While it may look like a road-going Lancer Evolution X, it is a properly gutted out race car with a handful of racing gadgets and a full roll cage. And while Mitsubishi has had its success in rally racing, this car is a road racing car. Take advantage of its 4WD drivetrain to conquer any course in Automobilista. 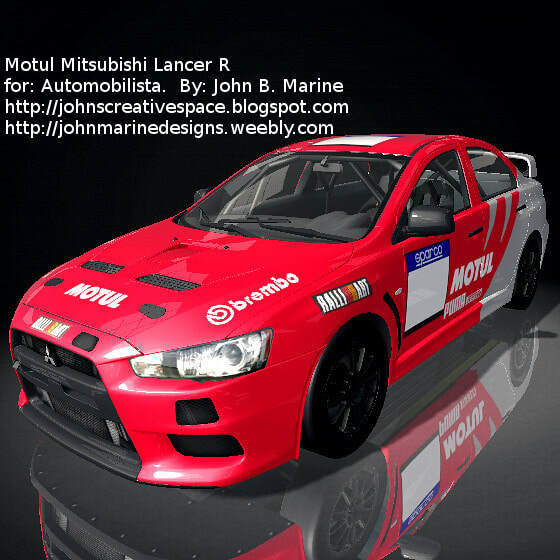 This is a Mitsubishi Lancer R in Motul livery. FUN FACT: The Mitsubishi Lancer R is officially the 10th different vehicle in Automobilista I skinned! 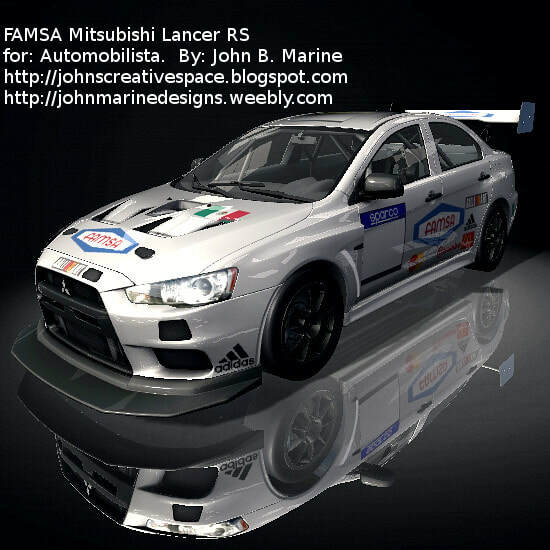 The Mitsubishi Lancer RS is raced in a Brazilian series, but this car features the livery of Mexican company FAMSA. Believe it or not, this skin you see here could be part of a skin pack I am working on. 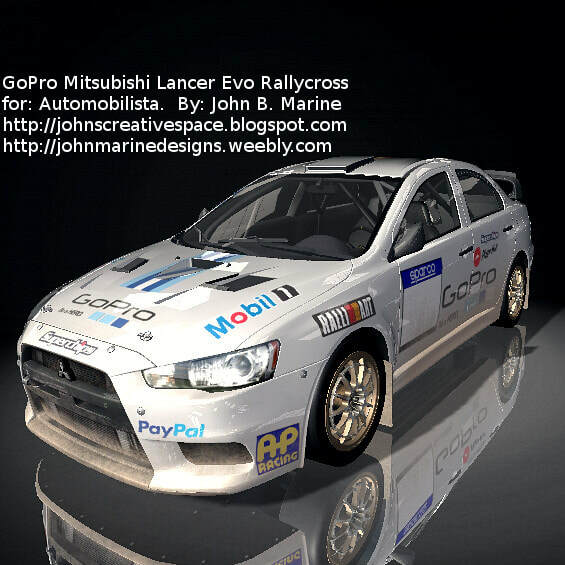 GoPro is the main sponsor of this Mitsubishi Lancer Rallycross. 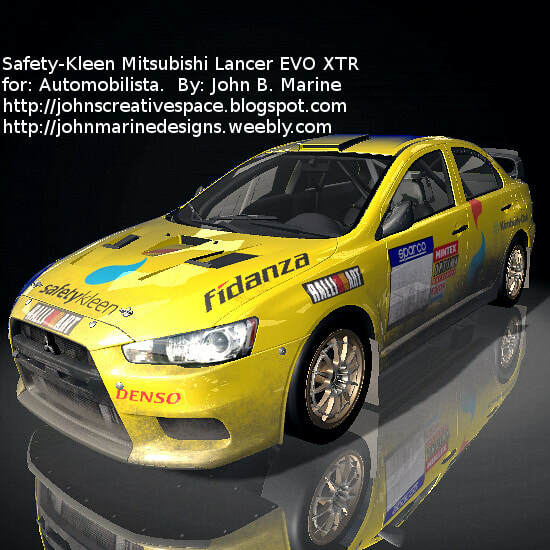 The sponsor of this car is Safety-Kleen, but this Mitsubishi Lancer EVO XTR is dirty! I experimented with making the car dirtier than usual with extra layers of dirt and mud. "Honey, I shrunk the Camaro!" Meet the ARC, or Aussie Racing Cars. One update of Automobilista brought the fabulous nation of Australia to AMS. In the update were the likes of the Adelaide Street Circuit and the ARC cars. Mustang fans would be disappointed since this package doesn't feature ARC Mustangs. ARC cars are kind of like the Legends Cars here in the United States, in that these are miniature-scale race cars powered by motorcycle engines. Each ARC Camaro packs about 107 horsepower. These cars can be fun to drive and with some frenzied races. 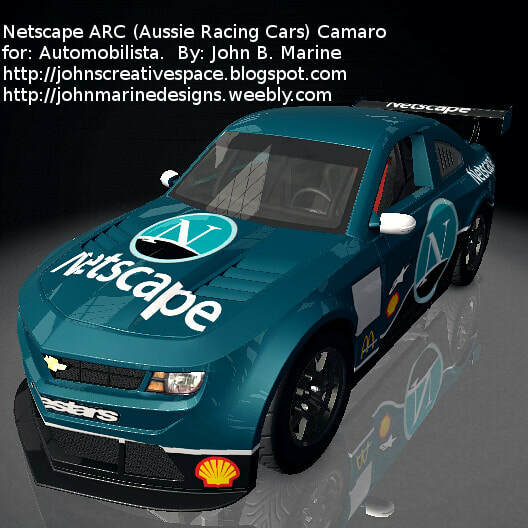 I designed this skin with Netscape livery. This is part of a planned skin pack with the theme of '90s technology. 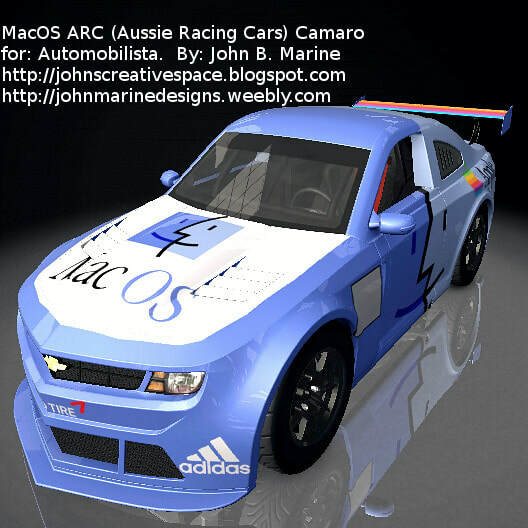 As part of a skin pack themed on '90s technology, this is my MacOS livery on the ARC Camaro. The rainbow design on the rear wing is a reference to Apple's rainbow logo. 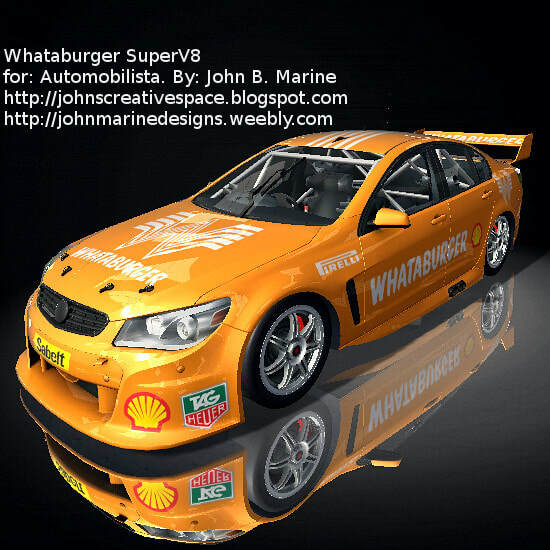 This is my Whataburger livery for the Super V8 car in Automobilista. This Super V8 car was painted in special livery. It was developed for May, which is Mental Health Awareness Month. The main campaign is #BreakTheStigma . Go with the flow. 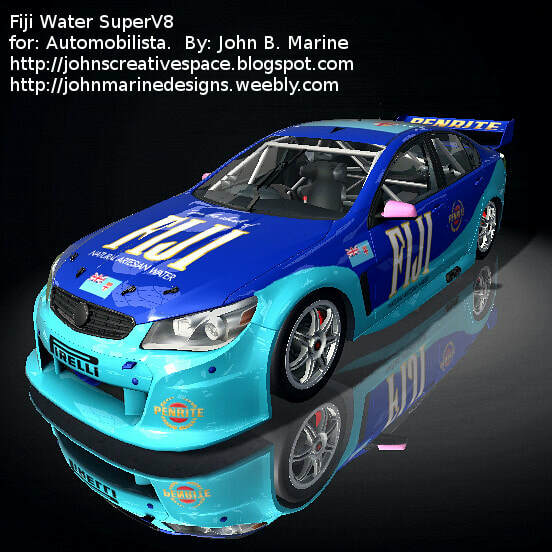 It is Fiji Water that is the main livery for this Super V8 car. 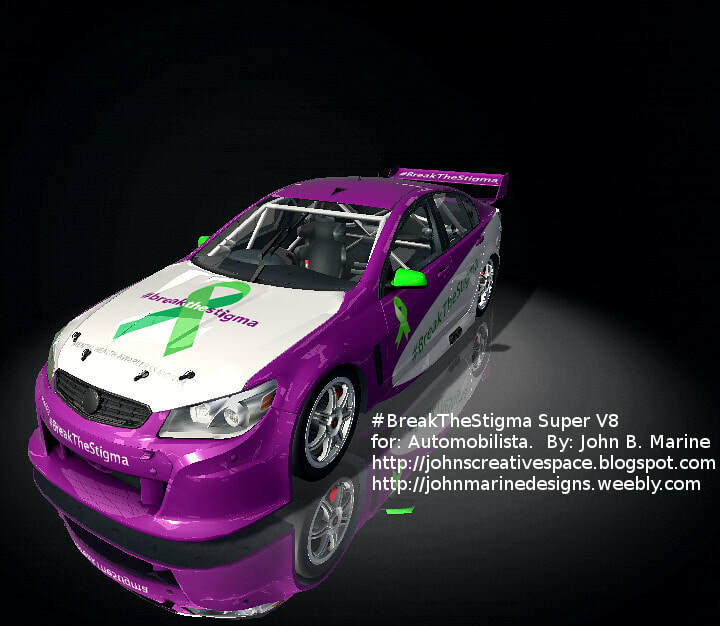 This picture shows extra angles of my #BreakTheStigma Super V8 car. 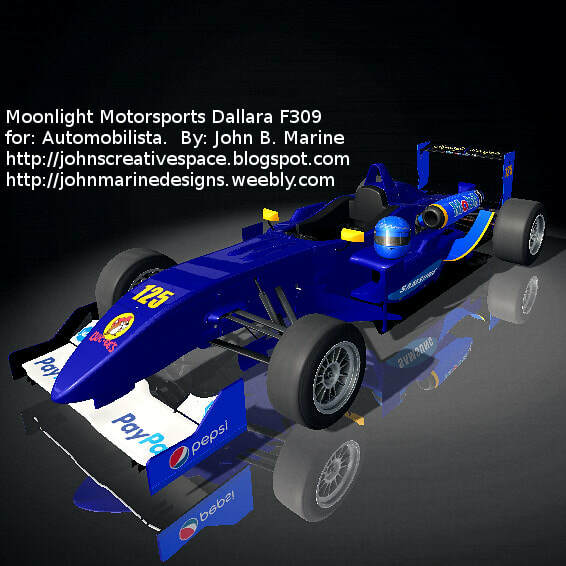 This is a Formula 3 (Dallara F309 chassis) race car painted in my fictional Moonlight Motorsports livery. 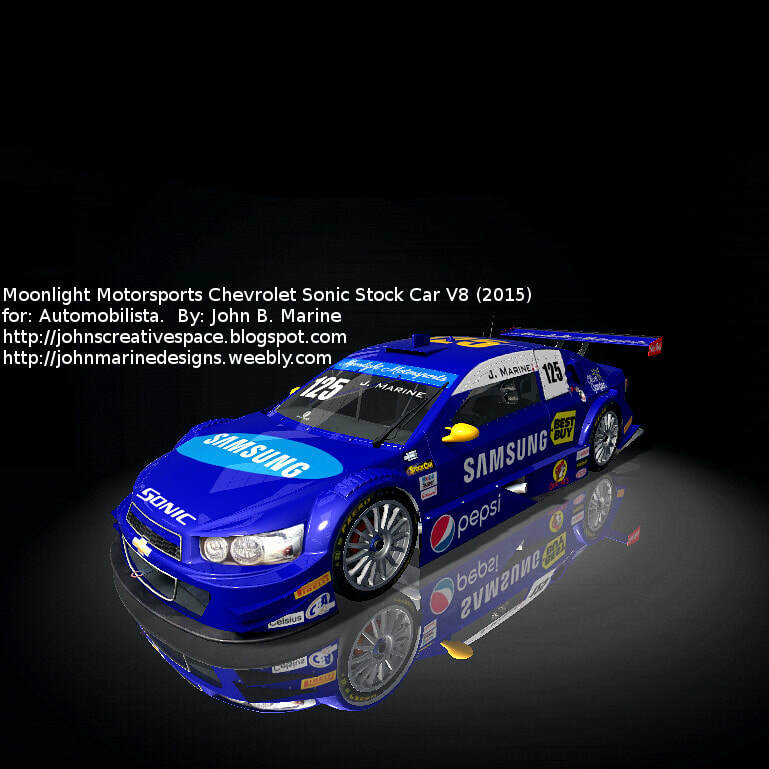 ​The premier category of racing in Automobilista is the Stock Car V8 series. In fact, it is the premier series of Automobilista and the former Game Stock Car Extreme. It is Brazil's premier racing series. The 2015 season of Stock Car V8 features the Chevrolet Sonic and the Peugeot 406. These cars are powered by V8 normally-aspirated engines pushing about 488 horsepower. While stock car suggests oval racing, these stock cars turn left AND right. In fact, they are more in line with Germany's DTM than the stock cars we are used to in the United States. 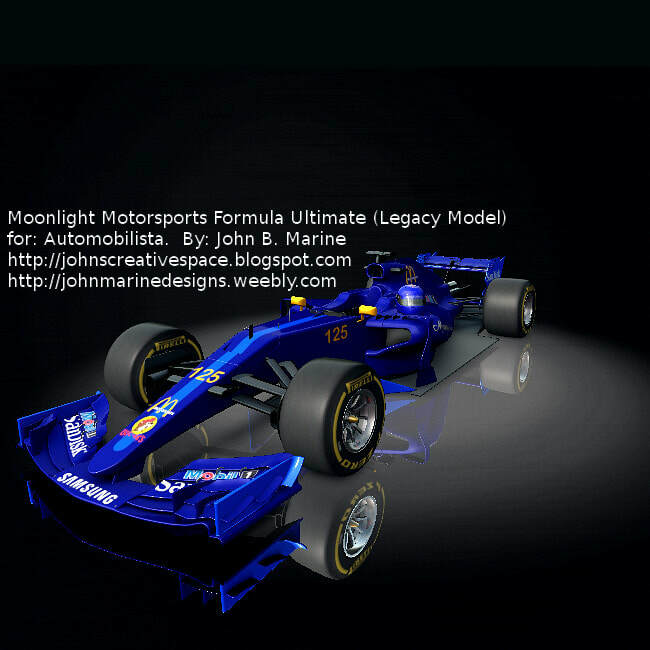 This is a Formula Ultimate car in my Moonlight Motorsports colors. The reason why I call this a "legacy car" is because this car is an older model Formula Ultimate and does not include the halo.